The Invisible® Vision Super-UVi (SUVi) series of patented camera intensifiers are designed for the most exacting scientific applications. They offer an unparalleled resolution of over 75 lp/mm coupled with extremely high output power/life and linear signal amplification necessary for quantitative data capture. Easily synchronized and optically lens coupled to a high speed video camera, each video frame may be programmably gated from 50ns and upwards in 10ns steps to repetition rates of up to 1MHz. 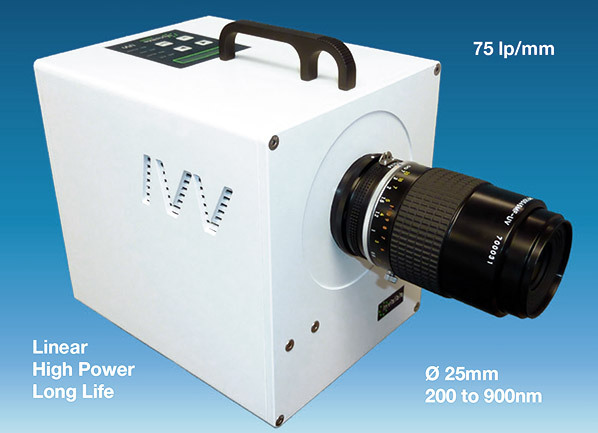 Available with either S20 or S25 photocathodes, the unique patented system offers deep UV to visible response (200 to 900nm) with modest system gain into a P46 (green) fast decay output phosphor, but may also be coupled to a front end MCP derived intensifier (reducing linearity & MTF/resolution) for higher gain or faster gating. Typical applications are in PIV for fluid dynamics, combustion studies, electric discharge, biomedical and ballistics as well as many other high speed and ultra high speed macroscopic imaging requirements. The SUVi is easily programmed by its integral menu driven LCD display/control panel or via its USB interface and software to synchronize to external TTL or video signals; offering multiple programmable exposures and delays from 30ns at repetition rates of up to 1MHz and beyond in 100 frame burst trigger mode. Advanced features such as a fully user programmable output shutter monitor and an independent output strobes complement the system.